This is part two of my secret santa gifting with Marshalls. I was so excited to find out who was my secret santa and what they picked out for me. Dina, who blogs over at Sweetest Somethings picked out some lovely items and I couldn't wait to share them. Once I saw the FedEx truck pull up, I knew it was for me! I eagerly opened my package and immediately loved the items. I'm wearing the leopard scarf and studded clutch she picked out. I'm a huge fan of leopard, so I was excited to see one of my favorite prints in such a pretty scarf! 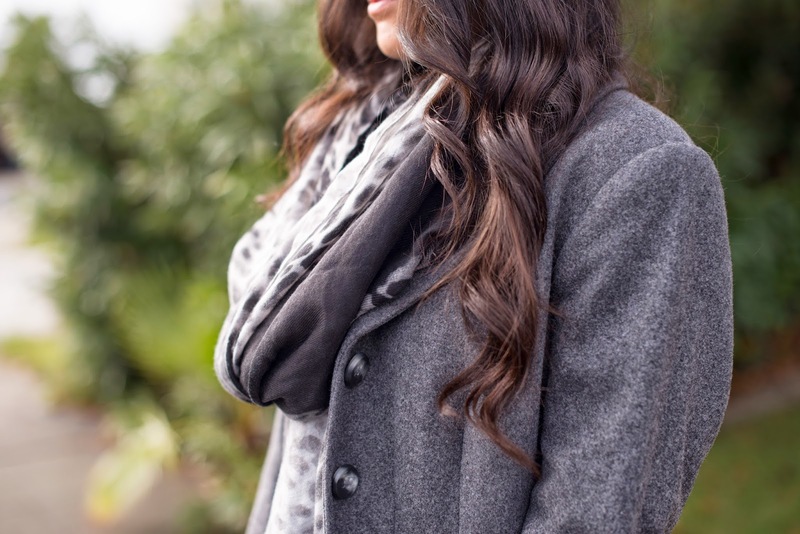 It's a light-weight scarf that's made with an ombre fabric and has a subtle leopard print throughout the scarf. And this studded clutch is amazing! It converts into a crossbody, making it perfect for when I'm on the go. The bright cobalt really pops against my monotone outfit and the gold studs add a little metallic sparkle. I can't wait to pair it with some brighter pieces later this season. BIG thank you to Marshalls for putting together such an awesome project! And Dina, thank you again for choosing such amazing items for me- I love them all! that coat and scarf are favorite items in this outfit, but I love the clutch too as it adds a nice pop of color!